They enable you to spend more time on your deck or patio with your family or friends. They extend fringe seasons such as early spring and late fall. But choosing the right one is not always easy, especially when you’re shopping online. You try to Google the term “Best Fire Pit” and see most of the returned results are lists of top 10, top 15, even top 50 best fire pits. If you try that route, you may end up wasting time even buying the one you don’t want. That’s the reason I created this all-in-one guide with 9 criteria to find your best fire pit. 1. Where Can You Use a Fire Pit? Fire pits are gaining in popularity as backyard accessories. Sizes, styles, and materials abound. You should base your choices on your budget, the space at hand, and, of course, local ordinances. For your backyard, you will also need to decide if you want a fire pit that’s built in. Or, you can select one of the options that are available online or in your local hardware store. For a built-in design, you can match your fire pit to the material your house is made of, or to other items in the backyard. If you have a small courtyard or patio, a chiminea or a small metal bowl might be your best bet. Some of the smaller models come equipped with a grill top in the event you want to do some outdoor cooking. You can also get a pit with a protective screen cover. The open sides allow you to add wood, and the cover stops rain from getting into the fire pan. You can also do built-in designs for your patio, where the flames shoot up from below the level of the pavers. Fire pits are also excellent for indoor spaces. Many of the indoor designs are portable, so you can move them from room to room, or outdoors. Worried about toxic fumes? You can buy a model that uses a clean burning fuel like ethanol. Few indoor fire pits call for complicated installation, and no building works are necessary. You just need to unpack, put it into position, and light it. If you’re throwing a party, you can bring it outdoors for added warmth. 2. What Type of Fuel Should I Use? Your main fuel choices are gas, propane, wood, gel, and electricity. Each of the fire pit fuel types will give you a lovely fire and heat to congregate around. We examine the pros and cons of each type here and you will find out what they’re best suited for. Fire pits that use natural gas are easy to light and do not give off embers, sparks, or smoke. The flames are also easy to extinguish, and they don’t leave any ashes for you to clean up. Because of these attributes, your building code is more likely to allow gas fire pits. Note that some codes do not allow the wood-burning ones. This type of pit never runs out of fuel and is trouble-free and convenient to maintain. You will need to have the gas company install a line. It’s also important to know that gas fire pits are not ideal for cooking or roasting. Like gas fire pits, those using propane have no ashes to hide coals. That makes it faster and easier to douse the blaze at the end of the night. You can turn them off in an instant, they don’t send up sparks, and they cool off in no time. A propane-fueled pit gives you a beautiful flame. It offers the same instant convenience as a gas barbecue grill. The heat source is away from the ground, so you can place them almost anywhere. The downside is that you will need to buy propane tanks ever so often, which can be pricey. Wood-burning fire pits allow you to build massive fires. A wood-burning pit is like having a campfire right in your backyard. There’s also the romance aspect and the factor of entertainment by involvement. Everybody likes to throw another log on the fire. These fire pits are affordable to install, and they enhance your ambiance. There are a few cons to wood fires. The smell of burning wood sticks to clothing. Starting a fire can be time-consuming, and it takes a lot of effort. The blowing smoke can also create discomfort, especially to allergy and asthma sufferers. 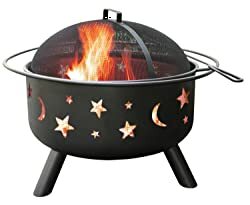 Many tabletop fire pit models use gel fuel, meaning no gas connections are necessary. You can use gel fuel both indoors and out. Gel fuel is odorless, clean burning, and inexpensive. It provides comfort and ambiance. The fuel burns slow and controlled, with a beautiful flame and little heat. They are more about looks than warmth. A typical can of gel will fuel a fire for about two hours, but the temperature is only about 3000 BTUs. Compare this to a large wood fire pit, which can radiate as much as 100,000 BTUs of heat. Gel fuel is clean and burns without producing smoke or a scent. You can also buy gel fueled logs for the look of a wood fire without the work. Electric fire pit technology has been around since the early 1980s. It has shown significant improvements in efficiency, beauty, and warmth. Electric fire pits are more or less fancy space heaters. Your first decision when considering an electric one is the location. Unlike other types of fire pit, electric models need a power source. You must locate them close to a power outlet. Another consideration for an electric fire pit is shelter. It’s undesirable to have these units and their components endure regular soakings. Most of these units are made for use in a sheltered area. Fire pit tables come in lots of styles and sizes. Enjoy choosing a style that’s right for you. Another important consideration is the fuel source. The traditional fuel is wood, but some models use propane and natural gas. Each type of fuel source has advantages and disadvantages. For example, wood is inexpensive and smells nice. But, it poses a fire hazard and can emit noxious fumes. Most people choose propane as their fuel of choice. Propane allows them the flexibility of moving their fire pit table as they see fit. It’s easy to find portable options online. You can even find folding fire pits that collapse for easy storage. These pits are lightweight and come with covers and carrying kits. The propane burning models emit a smokeless flame. This feature makes them perfect for camping trips, beach vacations, and backyard patio parties. Using a portable fire pit is easy. Plus, you won’t have to dig a permanent installation in your backyard. Always place portable ones on a level surface, away from overhanging tree branches. Freestanding fire pits don’t need a lot of space and can create ambiance in your backyard. These fire pits come in a variety of materials. One of the popular models is the cauldron style, named after the utensil that it resembles. Another popular freestanding style is the chiminea. Freestanding fire pits are often very heavy and aren’t meant to be moved from place to place. They are larger than portable fire pits and allow you to build an impressive fire. Landmann USA makes a popular, portable fire pit on wheels, which also functions as a grill. It comes equipped with grates for wood and cooking. Because it has wheels, you can easily transport the fire pit to the beach, campsite, or patio. It has a domed top, which pushes heat outward rather than straight up, so you and your companions will be warmer. The large single door makes it easy to clean, refuel, and roast marshmallows. You should take care when considering the material of your fire pit. From concrete to stone to clay, to brick and metal, we have seen the range of materials from which fire pits can be made. Some people opt to build a fire pit for their backyard escape. Stone is a versatile material, and you can use it to create a beautiful fire pit with a rustic look. For some types of stone and for larger pits, this project can be inexpensive. There’s always the option of hiring a professional to ensure that you abide by your neighborhood’s building codes. Note that you may also have to shell out for plumbing and changes to your landscaping. Bricks are available in different colors, shapes, sizes, and prices. Select the fire pit design and brick option that goes best with your landscape. Stone paver bricks are perfect for the main structure of the fire pit because of their large size. Standard clay brick is another option. Flagstones are natural stones ideal for capping off the top of the fire pit design. It’s essential to place a metal fire pit ring inside the structure to protect the brick from the heat. Note: You should not use non-treated river rocks, porous stone, or cinder blocks inside a pit. These materials can explode when placed near extreme heat. Standard building blocks will crack and need replacing over time. To prevent damage to your pit, line it with fire rated materials such as thick steel rings. Or you can buy a ready-made pit online, which will already have been fire tested. Bring a glow to your table with a ceramic fire bowl. Or you can invest in a ceramic chiminea. Ceramic fire pit bowls come in many shapes, sizes, and colors. They are odorless and clean-burning, you don’t need a vent, and you can use them both indoors and outdoors. Many of the faux logs used in non-wood burning fireplaces are ceramic as well. You can also buy ceramic fire balls online in a range of colors to suit your décor. Concrete may sound bland. But, even this base material gives you several exciting options from which to choose. For example, you can opt for a wood grain design. This design comes in different colors that can match your outdoor décor. Choose from rectangular, square, or circular designs. You can buy a concrete bowl fire pit or a table design. Fuel options vary as well, from gas to wood burning to ethanol. Concrete fire pits are durable. You will enjoy the comfort of your pit for a long time to come. Fire pits made from tumbled concrete pavers can blend well with the existing stonework. They look great when incorporated into a patio. Putting together a pit of concrete paver blocks is also a nice DIY project. You get the look of masonry without having to mix mortar or cut stone. But, for best results, you should leave the building of this type of fire pit to the professionals. Maintenance is easy: scrub with paver cleaner and use a sealant to prevent stains. As with pavers, if you’re an avid DIY-er, you can buy a kit to emulate the look of natural chiseled flagstone. The flagstones will add a charming old-world look to your outdoor living spaces. The stones are easy to align and install. Again, for best results, you should seek professional help. Flagstone fire pits need proper drainage. If you don’t install it properly, your hard work can go to waste in a short period of time. Terracotta fire pits are a trendy choice among many. They look great in any garden. They may also suit any other clay items you may have such as vegetable forcers and plant pots. The only drawback is that clay fire pits can sometimes crack. This happens especially in cold weather. Wood is the best fuel for terracotta pits. Coal and fire briquettes are not advised. They burn at higher temperatures and can also cause the unit to crack. You can buy a granite table fire pit online. Granite tables come in a broad range of sizes, colors, and shapes. This diversity of options allows architects and designers to personalize the look. Some use natural gas, while others are fueled by propane. These tables are cut from natural, unique granite slabs. This type of granite slab is usually used for high-end architectural applications. You can get a cover so your fire pit can turn into a beautiful, functional garden or patio table when it’s not in use. Create a work of art by adding a beautiful mosaic tile design to your backyard décor. You’re sure to make quite the statement regardless of the material you use for the actual pit. You have several options for the base. You can use flagstones, pavers, or concrete, and add the mosaic to the rim of the fire pit. As usual, DIY kits are available online. If you feel you can’t handle the project yourself, call in a professional. Make a unique, artistic statement with a tile fire pit. Most tile fire pits burn natural gas, though it’s possible to find one that’s wood burning. The manufacturers of these form them on a metal frame with a mesh body. They then apply the tile to the mesh body using standard masonry procedures. A tile fire pit is very heavy, so we recommend that you find a permanent spot for it in your backyard. You can find several steel fire pit models online with varying prices and quality. Steel is a great material. Professionals can mold it into any shape imaginable. Unprotected steel rusts over time, so be careful. Be sure to buy one that is powder coated and be aware of the physical changes that your fire pit may endure. It’s easy to find inexpensive models online in many sizes and styles. If you prefer an upmarket model, you might be able to find a unique piece handcrafted by a steel artisan. Cast iron is one of the most familiar materials used in construction. Fire pits are no exception. The material is easy to work with, low-priced, and light enough to move around when needed. To some, its lightweight nature is desirable, though it’s not as strong as wrought iron. You can get bowl-shaped fire pits, chimineas, and several other options. Most cast iron options are wood-burning. Copper is the king of materials when it comes to fire pits. Most copper fire pits develop a desirable patina over years of use, but they will not rust. Skilled copperworkers can mold the material into any shape. Plus, your copper fire pit will last forever. Copper fire pits tend to be expensive, but the price will be worth it. Copper will add a touch of elegance to your outdoor setting. Since copper is a soft metal, you will have to replace the nuts, bolts, screws, and rivets often. There are a vast diversity of shapes and designs on sale for you to choose from. Here are the most popular shapes of fire pits on the market. Or you can make it yourself to have a unique shape. Feel free to follow the creative ideas in the DIY guide part. Rectangular fire pits are an excellent choice if you have an outdoor sofa or another type of long seat. The fire pit then becomes a sort of coffee table. You can also use a rectangular fire pit as an accent piece next to a swimming pool. You can have your rectangular fire pit built into your backyard, or you can buy it online as a table design. Rectangular pits are available in a range of colors, sizes and fuel options. Check out the size of your backyard before purchasing to decide which option is best for you. Create a focal point in your garden with a square fire pit. The square shape is a matter of personal preference. The configuration will not affect the function of your fire pit. Many people find the square design to be aesthetically pleasing. Others will incorporate the look for feng shui and other reasons. Like rectangular ones, square pits are available in several colors, materials, and styles. You can build your own from a DIY kit or buy a square fire pit online. A chiminea is an outdoor fire pit shaped like a potbelly stove, but with a long funnel, or chimney. You can find hand-decorated, terracotta versions at tourist locations. You’ll also see them in markets in western states like Arizona and California, and in Mexico. The smoke blows up and out of the funnel. Chimineas are perfect for aromatic woods such as hickory or mesquite, cedar, or pinon wood. They emit a great deal of heat, but the fire is easy to contain. You should consider the dimensions of your pit before you buy. If the pit is too small, it won’t send out enough warmth, and it will be difficult for more than a few people to gather round. If it’s too big, the fire can get out of control. Smaller fire pits are made with the intention to be moved around often. This is the size to take if you’d like to have a fire pit that you can carry to a friend’s house, or on camping trips. Some of these fire pits even have carrying cases and foldable legs. These features allow for more expedient transportation. It’s also easy to find portable fire pits with wheels for easy transport and ash cleanup. Because of their cost, maneuverability, and convenience, medium or large fire pits are the most common. These fire pits will hold a decent amount of wood and are around 30 inches wide. Most medium and large fire pits have stands that make cleaning and disposing of ashes easy. You can find various types and styles within the medium range. Do you have the space to house a heavy duty fire pit? They can hold more wood, thus creating a bigger fire. This size might not be the best option if you intend on moving your fire pit often. Think carefully before purchasing a fire pit that’s more than three feet in diameter. It’s easy to find all the pieces and parts online to make an incredible fire pit. You can update the look of your fire pit, or replace worn parts, or DIY to build your own. DIY fire pit kits are a simple and cost-effective way for many people to go. These kits include the components needed to build a custom fire pit kit. DIY fire pits can be much cheaper than an already finished product, depending on the kit you buy. They can be easy to install once you look at the video and read the instructions. You should get a professional to connect the gas for you. A fire kit ring helps you contain the fire in your pit. Rings are the perfect starting point if you want to build your own fire pit. They are useful for lining materials such a brick, which do not hold up to the high temperatures very well. They last for years, only requiring minimal seasonal maintenance. After a few years, the bowl of your fire pit will need replacing. Get a new fire pit bowl that can comfortably accommodate standard-size hardwood logs. Your bowl should also be safety-tested against extreme heat and weather. Durable bowls are readily available online. Lava rocks are an understated design element that can help you set a romantic mood. You can also use rocks as fillers in flower pots and beds. They are essential for any Pacific Islander or Hawaiian theme. They also fit very well with Japanese or South Asian designs. These rocks also pair well with the dry, rugged look of Southwestern designs. Lava rocks are easy to buy online. Fire glass is tempered glass, which makes it very heat resistant. Pyrex® is another example of tempered glass. Like Pyrex, fire glass can withstand very extreme pressure and temperatures. It’s ideal for large fire pits because it makes a bold statement. The shiny glass accentuates the fire, increasing the flickering effect. In sizeable indoor fire pits, the glass can outshine everything else if the room is dark enough. Like rocks, fire glass is easy to buy online. You can buy a fire pit with a cooking grate that doubles as a grill. If it doesn’t, and you want to use your pit to barbecue meat, you can order a grate online. Apart from cooking, buy a grate so that the air will circulate in your pit for better combustion. If you have a gas fire pit, it’s a good idea to get a lid to protect your burner from the elements. In some cases, you can use this cover to turn your fire pit into a table. Several different sizes and options are available online. You can get a lid with or without a handle. You can also buy a square lid, a rectangular lid, or a round lid to fit the shape of your fire pit. Place a screen around your fire pit. This measure will lessen the odds of an errant spark causing injury or damage to property. Some fire pits come with a spark screen that fits over the unit to help catch embers. You can turn almost any fire pit into a barbecue pit, grill, or campfire. Or you can use your pit for decorative purposes. There’s nothing like the flavor of a fat, juicy steak grilled over real firewood embers. Wood-burning fire pits allow you to experience that. Almost anything you cook on a standard grill can be cooked on a fire pit. Another advantage is that most fire pits are larger than the averagely sized grill. The larger size makes it easier to prepare for big groups, making entertaining a breeze. Fire pits also give you versatility where fuel is concerned. They enable you to use charcoal or firewood. Fire pits are also perfect for campfire fun. A portable fire pit can generate a lot of heat, and you can set it up within minutes. It’s an excellent option for a campfire in locations where ground flames are not permitted. A fire pit can warm your group and give you good lighting without too much smoke. There’s a good reason why outdoor fire pits are one of the most popular design elements right now. They add a fun, unique, and relaxing element to any social space. You can incorporate design elements discussed earlier, such as paving stones or bricks. Many people prefer a fire pit on their deck, while others want one that will stand alone in their backyard. Every fire pit brand offers something unique and different. Here you will find the most well-known brands for fire pits. Landmann’s “Wildlife” is the ultimate mid-sized fire pit. It comes equipped with a spark screen and poker. It also features wildlife cutouts that glow for a unique evening atmosphere. It has a black finish for easier cleaning. “Wildlife” has a full diameter handle and includes a full-size cooking grate and a large fire bowl. The “Urban Cowboy” by Cowboy Cauldron is perfectly sized for most residential spaces. It gives you excellent flexibility as a cooking device and fire feature. It’s also a striking visual anchor for your outdoor area. It will extend your outdoor life by several weeks in the spring and the fall. It provides ample warmth for a crowd of six to ten. The thirty-inch basin doesn’t need much space and is more than adequate for small parties. Fall is the season to have a gathering around an outdoor fire pit beside the pool or in the garden. Agio makes quality fire pits in a range of styles, from bowls to tabletops and everything between. They specialize in propane fire pits covered with sparkling fire rocks. Agio is a unique and beautiful addition to any backyard or patio. Char-Broil makes a range of fire pits. One of their best options is a convenient portable bowl. This bowl brings warmth and a delightful glow to your backyard or campsite. In fact, you can bring it anywhere, even to a fall or spring beach gathering. It has a fine mesh screen that contains sparks, so you can have a safe view of the flames from all angles. You can remove it to roast marshmallows or tend the fire. The removable log grate elevates the firewood for increased airflow and improved burning. It accommodates wood and DuraFlame logs and charcoal. Uniflame is another producer of quality fire pits. Their Fire Pit Table adds style and function to your outdoor living space. You can enjoy your patio area in any season with this propane-powered fire pit. This pit delivers up to 30,000 BTUs of heat. It has a user-friendly, push-button electronic igniter to get the flame going. This table is the ideal thing for outdoor entertainment. Weber fire pits are perfect for keeping your party going. They produce lots of light and heat. They are perfect for those twilights spent outside in the garden with friends and family. A convenient slide aside lid holder acts as a wind block for the flames. It also serves as a heat deflector to help concentrate the warmth in one direction. The bowl and lid are both enameled with porcelain. This ensures protection against the elements, rust, and, of course, fire. Outland Living offers an assortment of quality fire pits. Their pits are well designed to make the most of your outdoor living experience. Their wood-burning fire pits include the Kitsilano and Oakridge models. Their propane pits include from the Standard to Premium and Deluxe, from Mega to Cypress, and Kerrisdale models. You can convert some of their propane models to natural gas using their conversion kit. The patented Whalen fire pit is the original outdoor fireplace. It’s made portable by use of wheels attached to heavy steel legs. You can enjoy this portable fireplace in your backyard or on the beach. Or you can set it up at your campsite, or your tailgating event. Bring it to any other location where you wish to enjoy the sounds, smells, and warmth of a real wood fire. Patented screens enclose the fire. The Sojoe fire pit is well designed and functional. This deep metal fire pit has straight sides with decorative images. They come in many different decorative styles, from Kokopelli to Star & Moon. Sojoe paints its pits in a pretty terracotta color. These pits can also double as barbecue grills – they even include a grill grate and screen mesh lid. Accessories also include a rotisserie grill. Patina fire pits have a natural rust patina finish. They age beautifully as time goes by. The inside of the pit is lined with wire mesh. The mesh prevents embers and sparks from escaping through the cutout design. These pits come with a five-year warranty – they’re guaranteed not to burn or rust through for five years. They come assembled for immediate use. It’s portable, and easy to carry wherever you need to. Purchasing a fire pit online is a fast and easy option. You can buy from large chains such as Amazon, Home Depot and Lowes. Fire pit options are almost infinite online, and you’re sure to find what you’re looking for. Based on your area, you should be able to find quite a few fire pit options at your local home goods store. This is the fastest, most convenient option, as you can leave with your fire pit the same day. If you’re considering DIY, it may also be more expedient to shop for supplies at your local hardware store. Buying a fire pit at Lowe’s is as easy as any other online shopping experience. You click on the fire pit you want, pay for it, and they will deliver it to your address. You can get beauties like the Garden Treasures Antique black steel wood-burning fire pit. Or, you can buy the equipment needed to build a do-it-yourself pit such as the Ashland concrete DIY kit. When you shop at Lowe’s the result is a beautiful, durable fire pit you can be proud of. You can take advantage of clearance sales and hot deals both online and in local stores. Just look out for the promotions and see if they benefit you. If you’re vigilant, you can snag a fire pit at a small fraction of the original price. Now, it’s time to recap all the criteria once again to decide which is the best fire pit for you. Follow the 9 steps above and circle the option you want to go with. Then purchase one from an online marketplace or drive to a local store. You can do it yourself or splurge and get a contractor to build a fire pit for you. There are also plenty of easy DIY ideas, which will give you a great result. These ideas can also help you save money. A DIY pit is a great way to upgrade your home if you have a flair for this type of project. You can find several ideas online for your pit. An excellent reference source is https://homebnc.com/best-diy-firepit-ideas/. You will need a plan for the design of your fire pit. Your plan should take into consideration the tools and material required. Another factor is the amount of time it will take to build the fire pit you want. What’s the right fire pit to suit your landscape? It’s contingent on how large your backyard is, on its shape, and on how you plan to use your fire pit. Some people want the fire pit to be a focal point. Again, you can find several ideas online for incorporating your fire pit into your landscape. You’ve seen that it’s possible to create a fire pit in a weekend, once you have the right materials. And the components are easy to access: you can order a handy DIY kit online. Want a fire pit that’s built into your yard? You will need to follow your local community’s building and fire codes for proper placement of your pit. In many localities, you must set your fire pit at least ten feet away from your neighbors’ yards. You may also have to get a site inspection from local fire officials. This inspection is to ensure that your proposed location is safe. Your pit should be away from yard structures, fences, overhanging branches, etc. If you opt for a portable pit, you should set it atop a non-combustible surface. Suitable surfaces include stone, concrete, brick, or gravel. Putting a portable pit on a wooden deck can be hazardous due to the risk of flying embers. No matter what type of pit you end up buying or installing, you will need to observe some basic safety rules. Don’t use accelerants like lighter fluid or gasoline to start fires. Always check the wind direction first. Don’t wear flammable or loose-fitting clothing to light fires. Always make sure pets and children are at least three feet away from the fire. We hope that we’ve shown you fire pits are more than a place to roast marshmallows. But then, you already knew that. Buy one of our signature fire pits right here online, or get a DIY pit to start your own project. Tell us how it turns out: leave your comments or questions in the box below.